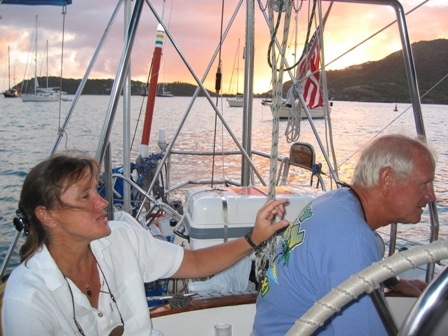 After sailing 40 NM from Deshaies in Guadeloupe, Marco and I landed in Falmouth Harbor in Antigua. 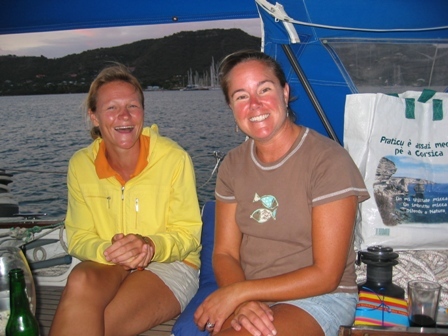 One of the main reasons we came to Antigua was to have the forestay checked out that was repaired in Mindelo, on Cape Verde. 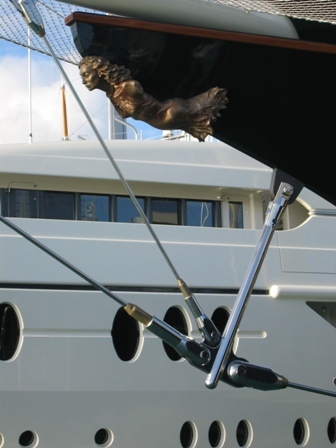 Stan at Antigua Rigging was very impressed with the job done and felt that we should be fine until we arrived back home in Rhode Island. Once again, great job Merciano and Zeca!! 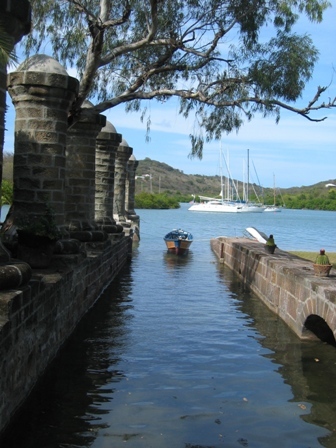 Antigua's island history dates back to 1775 BC when the Siboney tribe inhabited the island. 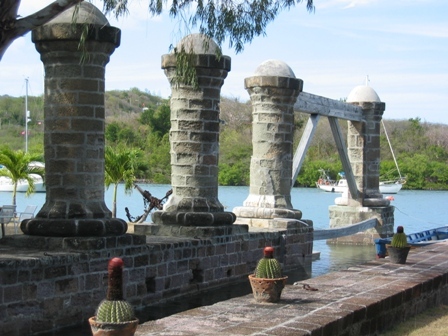 Then in 1493, on his second voyage to the New World, Christopher Columbus sighted and named Antigua, in honor of the miracle working saint, Santa Maria de la Antigua of Seville. More than an entire century later, in 1632, a English party from St. Kitts landed on the island and claimed it for the Crown of England. 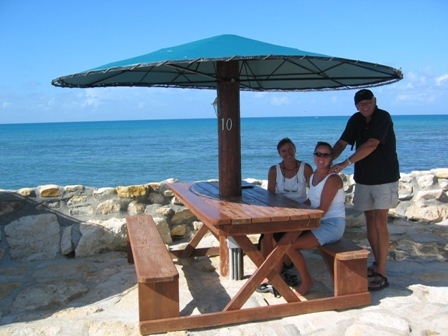 The three centuries that Antigua had been under English control has made it a very British place. 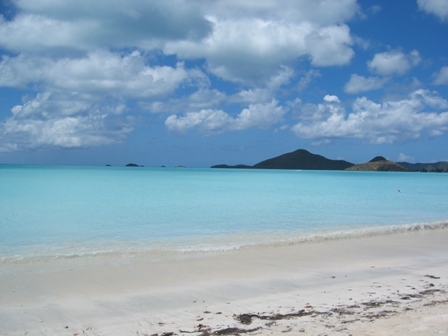 It would not be until 1981 when Antigua would gain full independence. Looking from Fort Shirley Battery, you can see English Harbor in the front and Falmouth Harbor in the back. 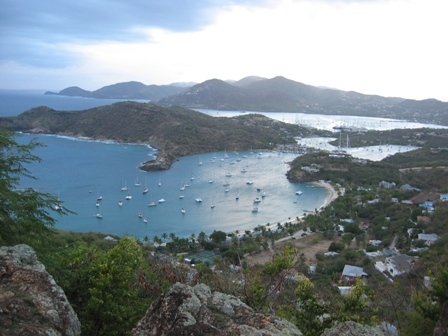 You can see why Antigua was and is such a fantastic haven for yachts. It has immediate access to trade winds, is easy to defend and is protected enough to careen a ship and keep it safe from a hurricane. 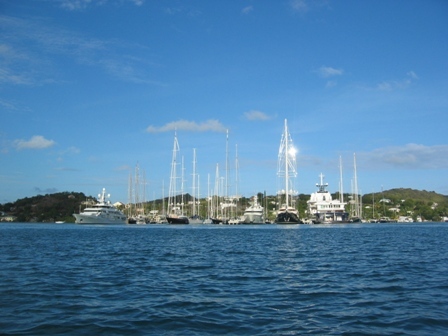 Antigua is now known for being the place that all the Caribbean's super yachts, sailing and power, call their main base. It is quite a sight when you sail around the bend and enter Falmouth Harbor to be greeted by such opulence. 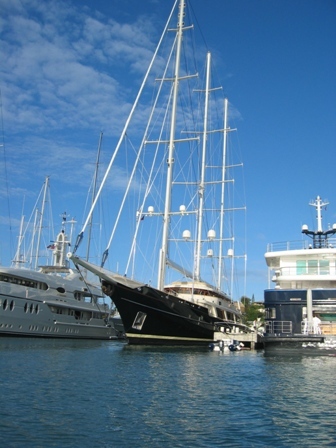 The 286 ft. Maltese Falcon was also here. 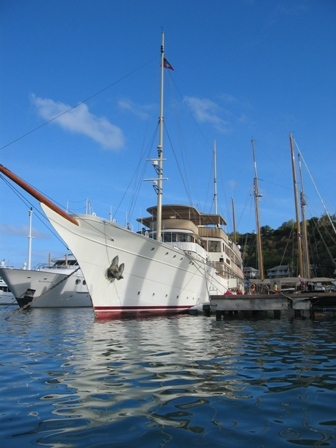 We were able to see her under full sail coming into Bequia. 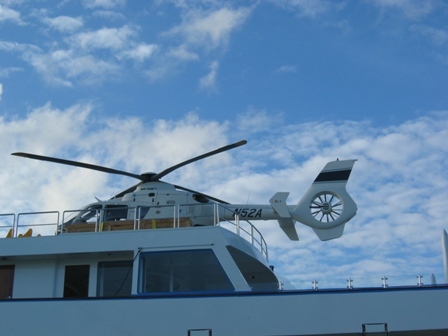 This was only one of a few super yachts that had their own helicopter on board. 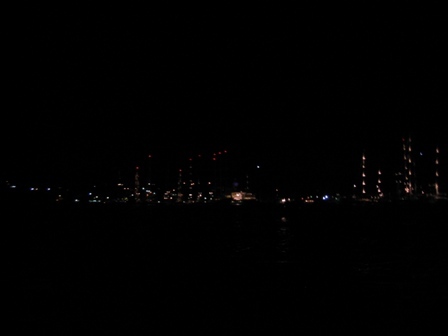 This is what the ships looked like at night with their masthead lights on, seen from the cockpit of Dalliance. It looked a little like a miniature city. 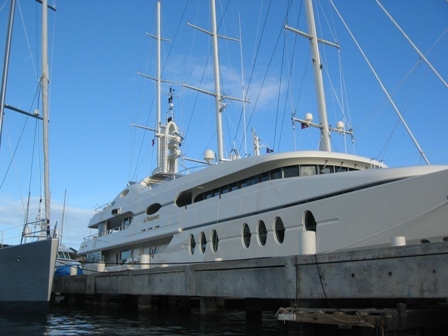 All of the larger sailing yachts have red lights on the top of their masts that they light at night for "aircraft safety". However, we were told by our friend Matt, that only if the mast is 100 meters (328 ft.) or higher, is there a need to have a red light showing at night. 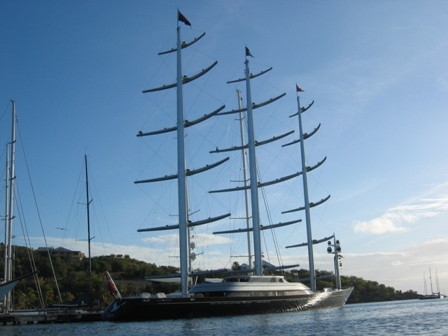 The 286 ft. clipper-rigged yacht, Maltese Falcon's rig only rises 190 feet above the deck while the rig of the 246 ft. sloop Mirabella V, which is the tallest sloop mast in the world, is only 291 ft. It seems that it has become more of a status symbol to have a red masthead light and not a necessity at all. Marco wants to put one on top of Dalliance's mast now!! 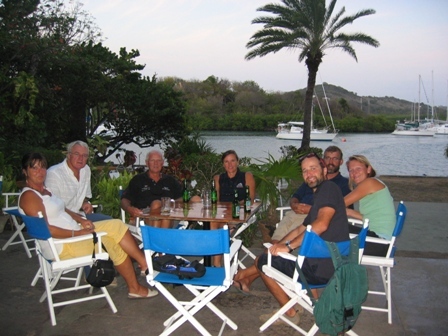 Our second evening in Antigua, the gang all got together for drinks at the Admiral's Inn in English harbor. From right to left we have: Ros and Andy from South Africa aboard Barbaro, Ed and Julie on Cinnabar, Marco, Judith and Harry from Austria aboard Durrus. The port and dockyard installations in English Harbor, called Nelson's Dockyard, were built between 1725 and 1746. English Harbor then became the home to the English Leeward Isles Squadron. From here, Admiral Rodney and later in 1784 the great Horatio Nelson, could easily control the whole Antilles. The Royal Navy ended up abandoning Nelson's Dockyard in 1889 and was allowed to fall to ruins. Then in 1947, a former commander, Vernon Nicholson, sailed into English Harbor saw the potential that is had for the head quarters for a charter company, and in 1949 began restoration of the ruins. 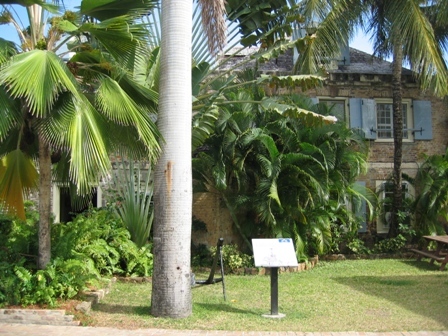 Nelson's Dockyard is now a functioning monument of times gone by. It is amazing to see the innovative sailing vessels of today moored along side a ship yard from years gone by, it is quite a contrast. Today, only the boat dock and pillars remain of the 1797 boat house that was damaged by the earthquake in 1843 and a hurricane in 1871. Boats carrying sails for repair entered on the inlet and the sails were hoisted up to the loft through a trap-door, to be repaired. The Old Copper and Lumber store is now a beautiful place to have drinks and dinner. It didn't take long for Andy, Harry and Marco to get together one night for a jam session. Harry went to music school in Vienna, where he formed a band called, "Flat Lizard" and produced a CD. Andy, from Barbaro, is a self taught guitarists and Marco has been playing the guitar since he was 14. 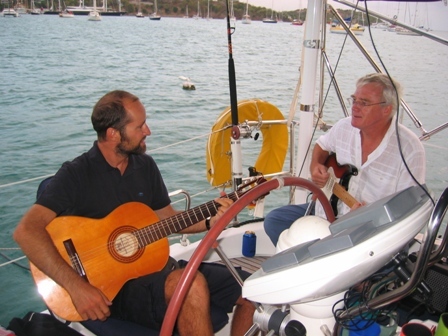 So, we all went aboard Barbaro, with heavy appetizers and guitars in hand and had a fantastic evening singing and playing favorite songs. 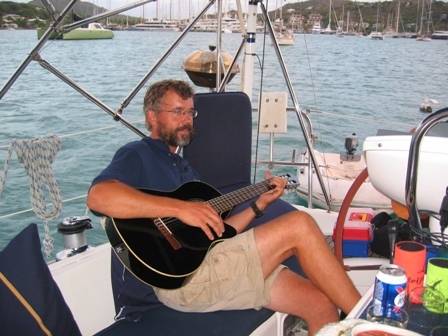 We even had requests from a neighboring boat for Eric Clapton. The boys were able to grant that request beautifully. 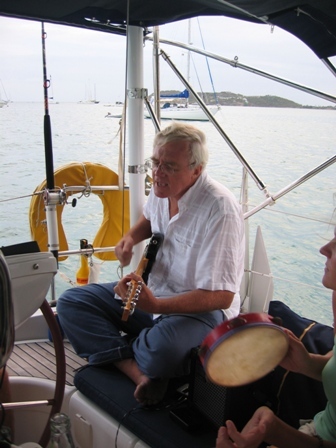 Harry and Judith from Durrus coming aboard Barbaro for the jam session. Harry and Andy warming up. 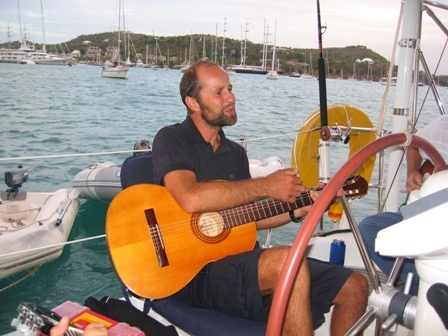 Andy not only had an acoustic guitar on board but he also had an electric guitar with an amplifier. It didn't take long for Harry to take over the electric guitar but with the salt air exposure the strings rusted easily and in no time broke the E string twice, and there was only one replacement. Harry said, "that's O.K., I can play with only 5 strings", and the music continued. Harry strumming along on his acoustic guitar. Andy getting into the music. Marco learning some new tunes from the pros and balancing out the trio. 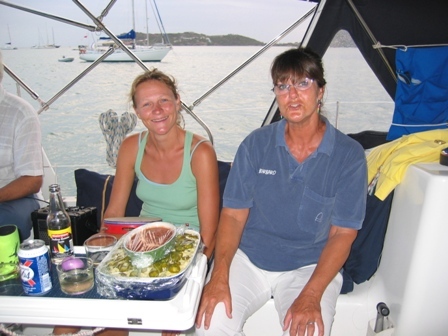 Any band would be incomplete without percussion so Judith was on tambourine and Ros was on the shaker. The three of us were also the backup singers and music coordinators. Ed, Julie, Marco and I decided one day to rent a car and tour the island. They drive on the left hand side of the road so we were very glad that Ed volunteered to drive. We started the day in Falmouth and drove clockwise around the island. 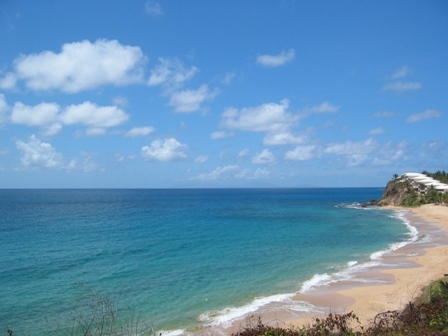 The west side of the coast was a succession of long sandy white beaches each as fine as the next and hardly developed at all. Morris Bay with Reed Point in the distance. The water here was a milky white from the very fine white sand. You could stand in the water and not see your toes. 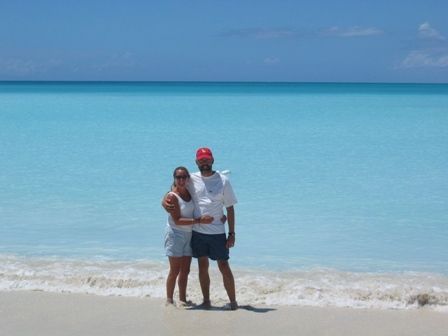 Marco and I at Morris Bay. The different shades of blues from light to dark blue was spectacular. Julie, Ed and I, as the four of us stopped for a drink with a view. While in Falmouth Harbor, I celebrated my 41st birthday and it was a great day!! Harry and Judith, Ed and Julie and Matt came over to Dalliance to celebrate with me. Julie brought smoked oysters over, I made a lasagna, Matt brought the wine, and Judith brought a fantastic Coffee Flan that she made for dessert. We ate a lot and laughed a lot. Thanks you guys for a great day!!! Julie and Ed partying with the sun setting in the background. 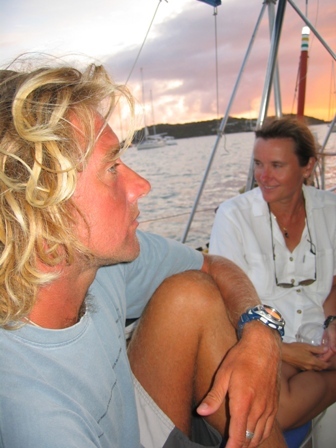 Matt, aboard Milko, is from England, and partied along with us. 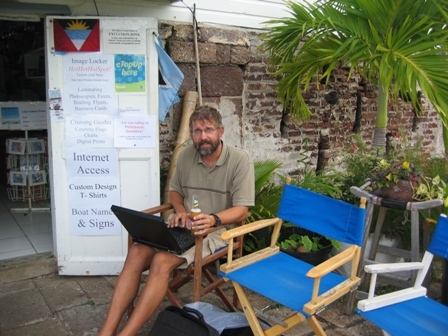 Marco updating the website in English Harbor at Nelson's Dockyard Services.